I heard Pitbull was the best stand...what would you guys recommend? Also, are stands strong enough to hold a 220 lb. rider sitting on them? 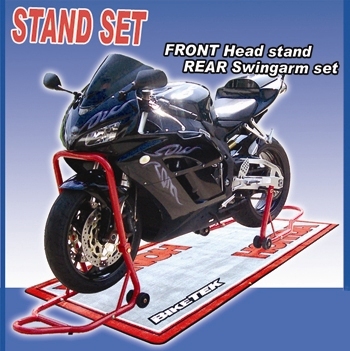 The below pics are from http://moto-madness.com/catalog/inde...roducts_id=315...I can't tell ifthis comes with THREE stands or TWO??? spools are in the mail...i appriciate the advice...can u think of another way to practice other than having 2 large guys holding either end of my bike while i do it? Also, what is the best (strongest, best quality) brand of stand? I've used a ton of different stands: LP, Vortex, Handy, T-rex, Power Stands, and more. Pit Bull are definately the best, and Woodcraft are a very close second. Both are expensive, but with stands you do get what you pay for. With my current Pit bull set-up and have no issues getting up on my bike when it's on BOTH standsand moving around, including hanging off the side working on my body position, the bike is very stable, butI wouldn't try that with any of the cheaper stands that I've used in the past. 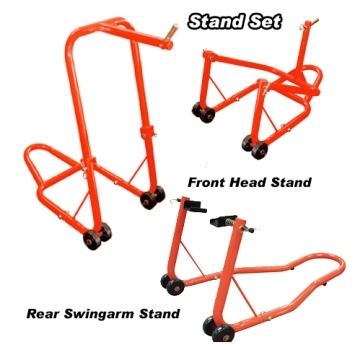 If you want a good price on pit bull stands, PM andI'll give you theinfo. I have a set of power stands and I rols my bike around on them but I do not think it would take movement like your talking about. I was thinking what you could do is get a wheel choke and put the bike in it and use tie downs to hold it in place ? ? ? I am not a stunter but it may work ? what do you guys think ? If you're going to practice that movewith the bike on a rear stand I'd recommend using a spool type rear stand but don't lift the bike at the spools. Slip a steel rod through the rear axlewith plenty of excess lengthand lift the bike at the rod. If you get real crazy wild in getting the bike moving sideways you should probably have someone spot you. Good luck.